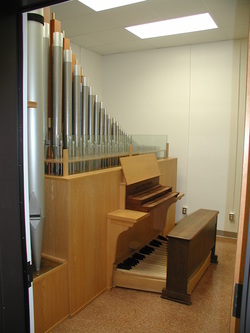 This organ, known as Holtkamp's Martini model, originally built for Morningside College in Sioux City, Iowa, was a gift from Dr. Edward H. Sibley and his wife. Through the generosity of his son and his wife Ed and June Sibley, this delightful organ was donated to Kansas State University and was relocated to 102A McCain Auditorium in February 2013 by Quimby Pipe Organs, Inc., the curator of the organs at Kansas State University. delivered early in the Spring of 1949.
conception, has proved to be remarkably durable. Over thirty of essentially the same design were in use in schools and a few churches across the country at the time of Holtkamp’s death in 1962."